1. the kinds of games/art/projects that when you propose them to a company, they would never make them. 2. the things that you are scared of making because you don’t think they would be successful. 3. the things that aren’t made unless somebody takes a chance. as an artist, it is our duty to make the Nevermakes – if we don’t make them, who will? make something that makes you feel something. anger. sadness. hunger. just feel. 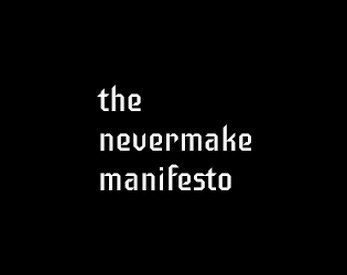 make the Nevermakes and never stop making the Nevermakes. never feel guilty over what you’ve created. if it is bad or offensive, apologize for it. make amends. guilt changes nothing, acting does. Nevermake is the guide for the artist who wants to help others find their dreams. Nevermake is the voice that is being shushed, but was caught on a recording and has been sampled hundreds of times. Nevermake is the passion project that is shown to 5 people and kept on your desktop forever. Nevermake is the dream and we can make the nevermake. Amazing! Inspiring! Thank you for writing this. I have a huge list of nevermakes I need to get to and reading this motivates me a lot.